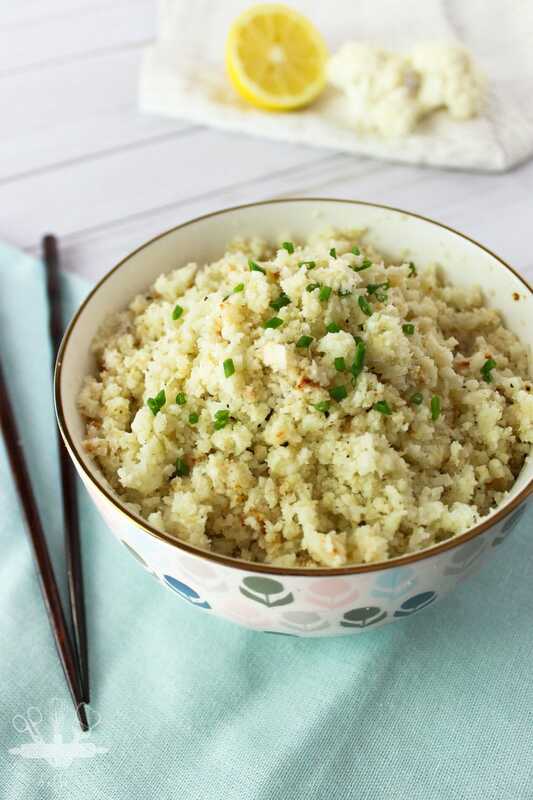 Learn how to make cauliflower rice to give your meals a low-carb spin or sneak some veggies into your kid’s diet. Seriously, they won’t know the difference! Serve it in your favorite rice based dish, eat it as a meal on it’s own, or cook up an extra large batch and freeze for a quick side on busy nights! 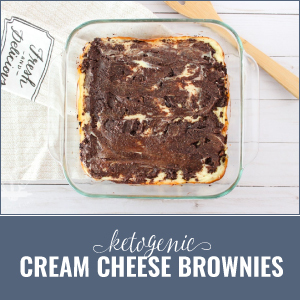 You may have heard me talk about how my husband and I started the Ketogenic Diet back in April, and read a little bit about our crazy results within the first month. Well, we are still at it and I seriously have no idea why we didn’t start sooner! We both have so much more energy, have lost significant amounts of weight, and just feel better overall. I’ve even noticed my chronic headaches have really subsided. Now, don’t get me wrong, I still struggle every so often with sugar and carb cravings. When I used to get a sweets craving I would whip up a batch of sugar cookie bars, but now instead I snack on a handful of almonds, or make a keto mug cake. One thing my husband I have both missed is eating rice. I think I even miss rice over pasta–but not bread because that’s just crazy talk. Luckily we both love Cauliflower, and since Aldi is so close to our new home, I can stock up on it for fairly cheap. 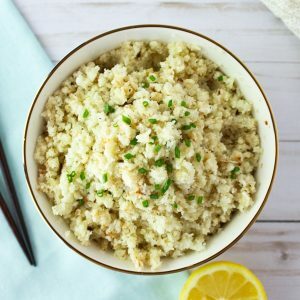 This cauliflower rice recipe is really very easy to make if you have a food processor or even a blender. It just takes a head of cauliflower, butter and salt and pepper. Really that’s it! I like to saute my cauliflower rice, but some people like to steam theirs. I think sauteing in butter gives it so much more flavor! One trick I have learned to make sure the rice gets “fluffy” instead of mushy is to squeeze the excess water out of the cauliflower after ricing but before sauteing. You can do this with cheese cloth or a flour sack towel! 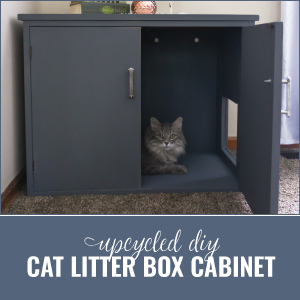 It does add an extra step but the results are worth it. 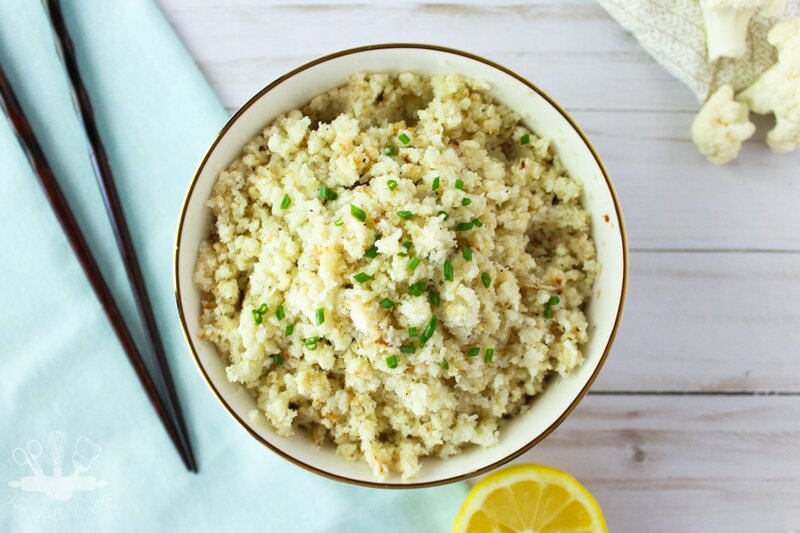 Switch up the seasonings, or add some parmesan cheese to give the cauliflower rice even more flavor. It’s really versatile! 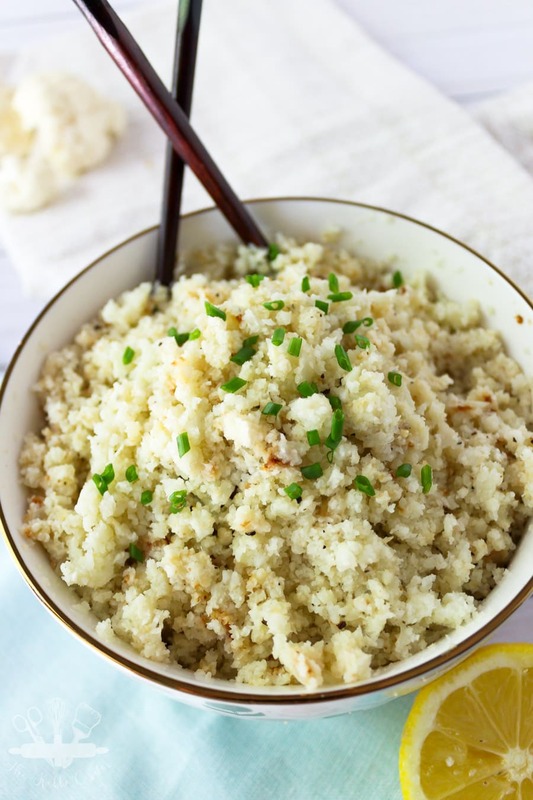 Place chunks of cauliflower in a food processor and process until it resembles rice. Place a piece of cheese cloth or other straining cloth over a large bowl. 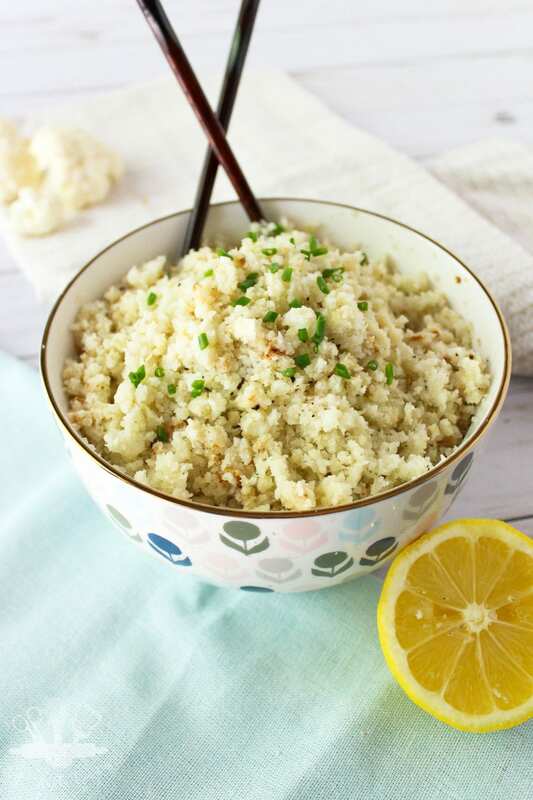 Pour riced cauliflower into cloth, cover and squeeze out excess moisture. Heat a large skillet over medium heat and melt butter. 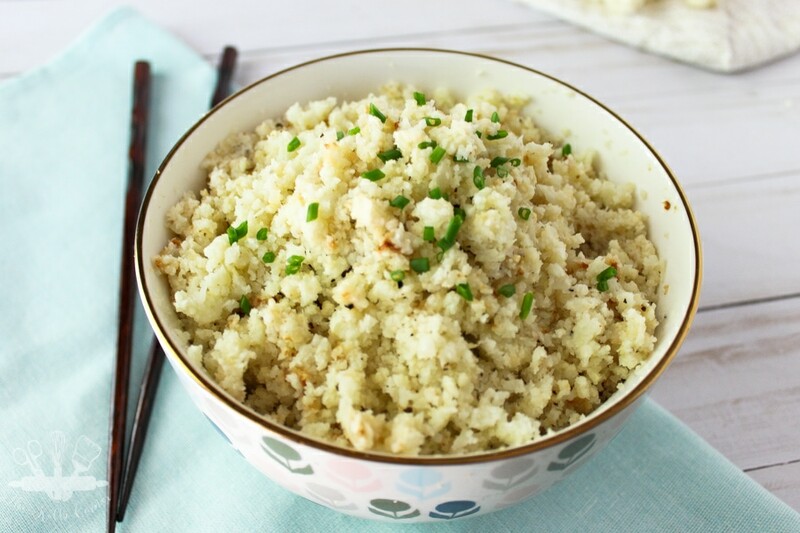 Place riced cauliflower in skillet and season with salt and pepper. Saute cauliflower for 5-7 minutes, until it starts to turn slightly golden and is tender. 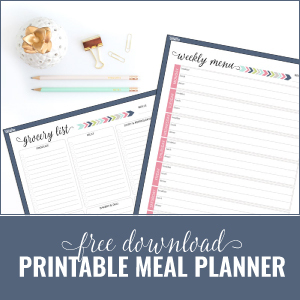 Serve as a companion to your favorite meal, or enjoy it as is!